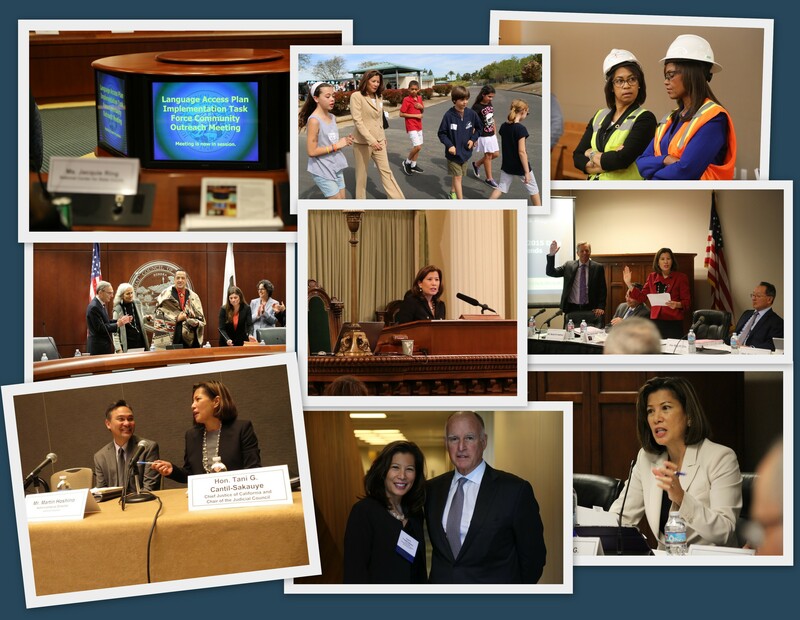 In 2016, the Judicial Council continued focusing on efforts to greater stabilize branch funding, improve branch governance, and to address fairness concerns raised by the public, our sister branches of government, and stakeholders throughout the state. Court Innovations – The 4th year in a row of new state general fund investment in the courts continued an emphasis on access to justice issues, including $25 million in grant funding to promote innovative and efficient court programs that serve the public. Chief Justice Tani Cantil-Sakauye created a Judicial Council working group to oversee the grant proposals. In addition, numerous effective and efficient court programs already developed are posted to the California courts website. Fines and Fees – The judicial branch is looking at the inequities of the court fines and fees structure, as it has morphed from a system of accountability to a means of raising revenue for essential government services. The Judicial Council received a $488,000 grant from the U.S. Department of Justice to identify issues related to defendants’ inability to pay fines and fees. The grant would include the development of an ability-to-pay calculator. In addition, Martin Hoshino, the council’s administrative director, was named to a national task force looking at the ongoing impact that court fines, fees, and bail practices have on communities—especially the economically disadvantaged—across the United States. Traffic Infractions – To ensure fairness and consistency in traffic cases, the Judicial Council adopted a rule directing courts to notify people who have traffic tickets that they can appear for arraignment and trial without deposit of bail, unless certain specified exceptions apply. The council also approved guidelines for courts and counties for an 18-month traffic amnesty program for unpaid tickets for traffic and non-traffic infractions. The amnesty program helps qualifying individuals by reducing their outstanding court-ordered debt and makes it easier for drivers to get their suspended licenses reinstated. The courts have resolved 175,936 delinquent accounts and collected nearly $30 million in the first 11 months of the program. Bail Reform – In her March 8 State of the Judiciary Address, Chief Justice Tani Cantil-Sakauye called for a review of the current bail system to ensure it adequately serves the purpose of protecting the public while ensuring a person’s appearance in court. Following up on her address, the Chief Justice established the Pretrial Detention Reform Work Group to study current pretrial detention practices and provide recommendations for potential reforms. In addition, the Judicial Council and the courts continue with 12 pilot projects that are testing the effectiveness of pretrial release programs. New Courthouse Construction – The judicial branch facilities program opened 5 new courthouses in 2016 to better serve residents in the counties of Kings, Merced, Santa Clara, Sutter, and Tehama. However, $1.4 billion in construction fund redirections made by the Governor and Legislature during the state’s fiscal crisis—and a decline in funds from reduced case filings fees—have jeopardized the branch’s ability to replace the many unsafe and inadequate court facilities around the state. At its August 26 meeting, the Judicial Council was forced to delay the schedules of its new courthouse projects and put most of them on hold until adequate funding can be restored. Language Access – Approximately 20% (about 7 million) of Californians have English language limitations. To help court users with limited English skills, a Judicial Council task force continues to make progress on implementing the council’s Strategic Plan for Language Access in the California Courts. The task force led the development of a pilot project for video remote interpreting and an online toolkit, which includes a model notice translated into eight languages that informs court users about language services and a model form to help courts track and facilitate requests. In addition, the Governor appropriated an additional $7 million in the 2016-17 State Budget to reimburse courts for increased interpreter expenses for civil cases. Public Access to Judicial Proceedings – To increase public access, understanding, and transparency of the court system, the California Supreme Court started live streaming its oral argument sessions. The court also added real-time captioning in English and Spanish and a companion document to the stream that identifies the justices, attorneys, cases, and the issue(s) under review. In addition, the Judicial Council began videocasting its public meetings and launched an online meeting information center that makes it easier to follow the meeting while viewing the agenda and reports. Civic Education – Less than 25% of young people reach “proficient” on a national assessment of civic knowledge. Chief Justice Tani G. Cantil-Sakauye created a civic learning initiative to address this gap, and increase access to justice by improving civic knowledge and participation. A driving force in this effort, the Power of Democracy Steering Committee helps to spotlight the need for civics in California K-12 education. Among many outreach efforts, the initiative presents the Civic Learning Award to schools that serve as models in providing civic education. The committee also contributed to a greater focus on civic learning in the new California History-Social Science Framework for educators.